Bridge Nylon is a high-quality material providing the strength of Nylon 645 with the flexibility of traditional nylon. 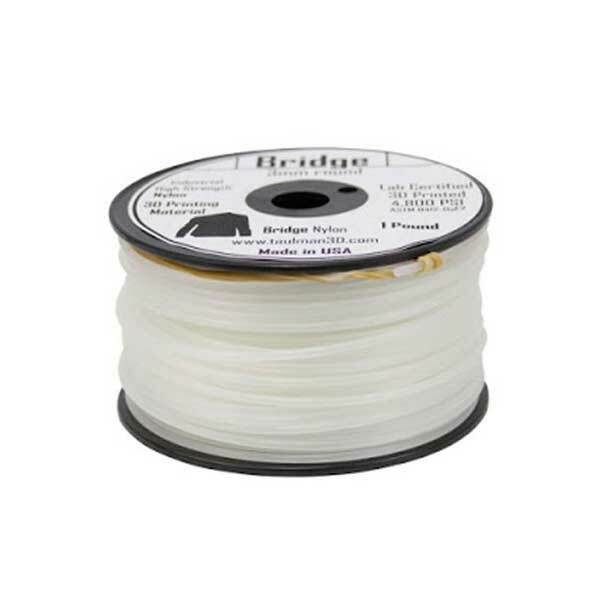 Bridge Nylon is designed to fulfill the demands of injection molded nylon parts while providing the convenience of 3D printing. The unique blend makes this product easier to print with and more resistant to moisture than other nylon blends. Bridge Nylon is a great general purpose nylon material with a low barrier to entry for strong, functional part production. Also great for engineering projects. Note: A heated bed is recommended for large-footprint parts. Bridge Nylon can absorb moisture which can negatively affect print quality, so a desiccant box is recommend for material storage.